Blue Bird in Blossom Tree Sun Catcher from Collections Etc. 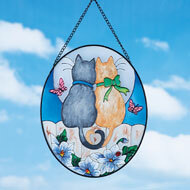 Hand-painted with beautiful colors, this suncatcher features a pair of bluebirds guarding a nest in a blossoming tree. 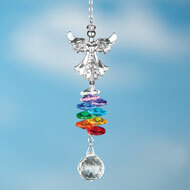 Hang it in a sunny window for a stunning view every day! 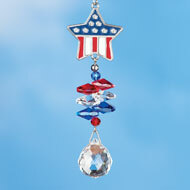 Includes a chain for easy hanging. Glass and iron. 5 1/4"L x 16 1/4"H.
Beautiful stained glass good quality. I was stunned. Piece is just lovely. Super pleased?  - KindredSpiritStudio, Saint Augustine, Fl. Beautiful when the sun hits it ! Attach this delightful sculpture to your downspout to direct water away from your foundation. 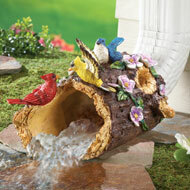 The charming, hand-painted downspout looks like a hollow tree stump covered in flowers and colorful birds. Hand-painted resin. 10"L x 6"W x 7"H.